As I mentioned before , Lynn E. Hazen is an author to watch. Her latest effort, The Amazing Trail of Seymour Snail, is a fun and engaging story that will appeal to early readers on many levels. Seymour is an artist: his happiest hours are spent painting, sculpting, and creating prints. Not only is he shy, he’s a snail, and snails are, well, S-L-O-W. But, when a well-timed gust of wind reveals his talent to his friends, they encourage him to get a job as an artist. His job search proves nearly fruitless until he finds a position at the Speedy Arts Gallery–a place where he isn’t sure he fits in and his only work involves sliming envelopes. His boss, Mr. Stink Bug, is demanding and overbearing, and when Seymour’s slowness impedes his ability to deliver a package on time, he is fired on his first day. Will he ever become an artist? 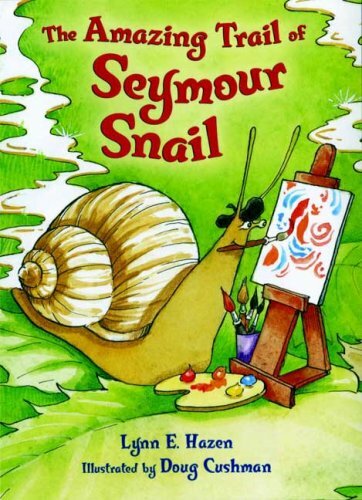 Young readers will get a kick out of the absolute “grossness” of this book–Seymour’s art involves a lot of slime, goo, and mud, and all of the main characters are bugs–even the great gallery owner, Coco La Roach, is a cockroach. The illustrations are very warm and friendly, and very well-done. The sweetness of the story really lies in Seymour’s can-do attitude, and his unwillingness to give up his dream, no matter how many obstacles he faces. When confronted with the job of sliming envelopes, Seymour reasons, “I guess even great artists have to start somewhere. I’ll try my best.” What really sent the message home is that Seymour finds he is excellent at sliming envelopes–but this does not challenge him enough. He doesn’t take the easy way out, and continues to strive to be the best he can be.